Who is that good looking guy in that wonderful hat that can keep your head warm in the cold weather like we had yesterday. will they fit a large heads. Will need a x-large or size 8. Some of us NFers have large heads, I can not wear many caps because even the large ones are snugs or to small for me. I know what you mean. That is a problem I have s well. This on fits me ok. You head is smaller then mine. I have a large head and it is hard for me to find one that fits. I have this one open to the largest setting. How does it look on me. Looks good. Not only have a large head, also hard headed. Thank you Francis. I hope we sell a lot of them as well. Thank you for posting. Shelley We saw snow in our area. We didn’t get snowed in. I like that idea Shelley. I saw that, Shelley. Be careful. You do not want to incur the wrath of Lou! How many hats are you going to buy Lou? It will be a great Christmas gift for Elena and Rie. Yes Shelley I’m getting ready. I want a lot of stuff. Cookies and cakes will be good enough. Even Starbucks stuff will be Great! Now that I think about it. An espresso machine. One that grounds the coffee beans. You hear me Lou!!!! Shelley I bet you are right about Lou. Only the cold kind. Shelley I think you need to read comment 22 carefull. Good Morning to all. Had my coffee and I ready to blog with anyone who would like to blog. Good morning everyone! Sorry, had Elena this weekend and we did a lot of father/daughter stuff! 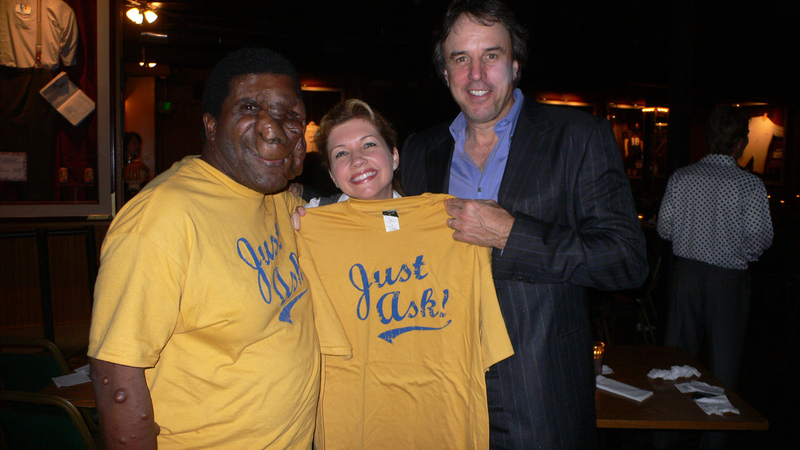 Looks like we’re going to have to order more “Just Ask!” shirts and hats! Thanks everyone for your orders, we are mailing them out as quickly as the orders are coming in. Reggie and I sent one to France last week! I hope you all can send us photos of you in the shirts so we can post on the site. The shirts and hats are really, really cool. Reggie do you know if Lou got you a coffee machine yet ? I met Lou at a Christmas Party this past weekend and was compelled to Just Ask him about his hat.. he turned me toward this site and I must say, you are doing an awesome job informing the world of this condition, and breaking down that social barrier that keeps people from finding out about it themselves. Keep up the great work Reggie, I’ll be ordering a shirt from Lou as soon as he gets more. Hey Justin, you made it! Welcome to the blog! We still have a few shirts left Justin. Are you an extra large? Reggie, Justin is a rock climber. Yep, he climbs up rocks without a safety net. He also does yoga. And he lives in The Heights. Kind of reminds me of…well, me! hello my friend, I have seen the discovery chanel program neurofibromatosis you left I really want you to know that you have a big heart and a great value because it is so easy to leave and face the world and say “I am and I do not care what they say I’m happy to be “I am glad to know there are people like you in the world I’ve been a great inspiration sometimes I feel bad that I get a pimple on the face and I realize things passing and still others do not complain like you, have a great value and a big heart, please never change, I want to friend you send a big hello and a hug from Argentina. if some day we are given the opportunity because I hope to meet people like you do not see many times in life.